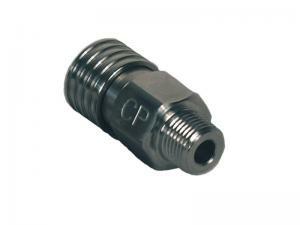 CP's version of the stainless steel quick disconnect coupler has a distinctive retractable sleeve, easy to grasp even while wearing gloves or when your hands are slippery. Standard 1/8" NPT threads on male side, stainless steel is the recommended choice for use with high pressure fill stations and scuba yokes. Made in USA.